The platform is built for tourists from outside Japan, particularly those from China and Southeast Asian countries. With its 21 World Heritage Sites and a tapestry of culture, Japan attracts millions of foreign tourists every year. According to statistics compiled by JTB Tourism Research and Consulting, more than 31 million international visitors entered the country in 2018. The statistic also showed that nearly two-thirds of the overseas visitors who stopped in Japan in 2017 were from China, South Korea, and Taiwan. Four Southeast Asian countries—Thailand, Malaysia, Philippines, and Singapore—were among the top ten nations whose citizens visited Japan. Taking advantage of its home country’s draw, Japan Foodie, a restaurant search and discovery app for international tourists, has launched a mobile payment platform called TakeMe Pay. The multi-payment gateway provides various mobile and online payment services from around the world, and aims to simplify online transactions for tourists in Japan. According to Japan Foodie founder and CEO Dong Lu, mobile payment services are taking off in Japan. The country now has various platforms, including PayPay, Rakuten Pay, LINE Pay, and more. 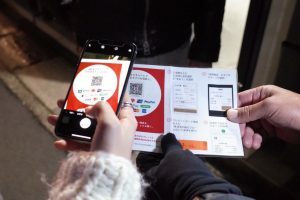 Alibaba’s Alipay and Tencent’s WeChat Pay are also commonly used by Chinese tourists who visit Japan. TakeMe Pay aggregates an abundance of payment services—including local and Chinese platforms, as well as international payment methods like Visa, Master, or Apple Pay—in one app. Merchants can also benefit from TakeMe Pay by placing a QR code in their shop, as the platform provides one workflow for all the payment brands. TakeMe Pay will also release a software development kit (SDK) centered around the platform, enabling traditional point of sales (POS) machines to accept smartphone payments. By integrating TakeMe Pay’s SDK into POS terminals, merchants can use their existing hardware with bar code scanners to utilise multiple payment platforms. Merchants will be able to take part in transactions that use smartphones without physically changing their equipment or adding external devices. The software modifications can simplify payment operations and sidestep costs for new machines. TakeMe Pay is also integrated into its parent platform, Japan Foodie, so users can easily find local shops and restaurants, reserve their tables, and pay for their food in a single app. “Japan Foodie’s mission is to give authentic Japan experience for foreign visitors. Therefore, we give information about the best local restaurants or attractions that are not always available on the internet,” said Japan Foodie’s head of Southeast Asia, Ory Rusli, to KrASIA. “TakeMe Pay is further supporting our mission to give one-stop solution for overseas tourists visiting Japan,” he added. China and Southeast Asia are currently the biggest markets for Japan Foodie and TakeMe Pay. The platforms are available in four languages—Japanese, English, Chinese, and Korean.